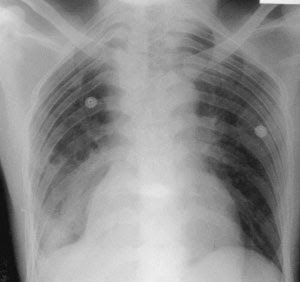 A 28 year old male with a PMH of sickle cell disease presents to the emergency department complaining of a one day history of worsening shortness of breath and a subjective sensation of fever. He states this was preceded by 3 days of intractable “sickle cell crisis” pain unrelieved by his home pain medications. When questioned further about the nature of this pain, he reports lower back and bilateral lower extremity pain which is typical of his previous sickle cell crises. After thinking about it, however, he does report that this time a new right lower chest pain accompanied his usual symptoms. His home medications include morphine and dilaudid po. General:He appears to be anxious and in mild respiratory distress with no accessory muscle use. Back: No tenderness to palpation throughout cervical, thoracic, and lumbar spine. No bony deformity, crepitus, or step-offs noted. 2. Of the following, which is the most common complication of acute chest syndrome? 3. Which of the following pathogens is most likely associated with acute chest syndrome? 4. Imagine you're lost in the woods, have sickle cell, get dehydrated, and develop an acute chest syndrome. Which of the following devices would you most wish you had brought? Also, it's 1910.